Compare multiple graphs by sketching their functions in the same Graph workspace. Enter one equation per line by using the enter key. 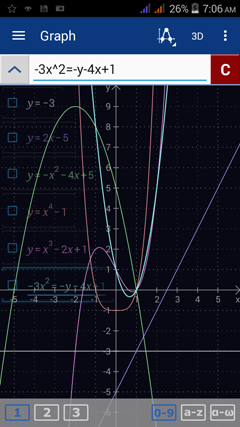 The font color of the graph in the top left corresponds to the color of its curve. Enter each expression with one expression per line. If it is written as "y =," you only need to type the expression after y =. Use the exponent key x^n to enter an exponent. Type the variable y by tapping the x variable key twice.